Both looking for romance, of course, and politics provided a strong foundation. All their lives: politics – always politics – and romance mostly a dream. Kids and marriages came and went. Then at the combined age of 141, there he was, “Mr. Politico,” online, looking for a traveling companion. And Bonnie, just 2 days old on Green Singles, with the tagline “Lioness Looking for her Lion,” wrote “liked your profile – you seem honest and straightforward.” Coffee being out of the question – she lived in Santa Fe – he in the Twin Cities – they became pen-pals. But with the idea of actually meeting clearly on the table - she had to tell him about the skeleton in her closet, that she thought for sure would be a deal breaker, “I need to tell you something that I wish I didn’t have to, but it’s only fair before we go any further . . . So there I’ve said it.” Immediately Clyde wrote, “Wanted to write right away, so you know I’m not looking to run-away. We can figure this out. Looks like we can talk about anything, which is the way it’s supposed to be.” Reading that, she started crying, overwhelmed by his kind words. Feeling a sense of relief, thinking maybe she could still find true love in her life. Starting a political blog on their third date. First date was 4 days in June in Santa Fe. “Let’s not fall off the mountain,” Bonnie said during a long moonlit kiss leaning against the car their first night together, on some abandoned mountain road half way to Taos, and the Chimayo B&B. Now, they are in the midst of their third date traveling the country visiting friends, and talking up democracy. They spent the first two weeks campaigning for Kendra Horn, running for Congress in Oklahoma’s 5th District. They have a plan to end this date spending the last two weeks of January on the beach at Playa Zipolite, Mexico. Some are incredulous about being together for four months on just a third date, but so far so good: still having fun, still under budget, and still in love. To you doubters: Not many thought Kendra was going to win either – a seat no Democrat has held since 1974 – now a blue dot in red, red Oklahoma – a sign, they believe, of things to come. And how’s our love life doing? Just great, even finding new depths. A friendship with a sense of responsibility for each other’s well-being. Just yesterday we talked about living in the now – not circumscribing what the future might bring – yet knowing we can count on each other, juxtaposing the two. And maybe, best of all, still being playful, liking each other, laughing, reading aloud, being romantic, trying new things, sharing a sense of joy with the friends we’re catching-up with and the new friends we’re making. Quentin, here from Chicago and camping alone, is applying to be a forest fire fighter. He believes it’s just a matter of time, percentages: the youth of today “get it.” Eighty-four year old Liebe is not so sure. She’s still into rugged individualism being necessary to make it in the face of prejudice, a rigged system, and so much inequality. Count us as lucky. Yes, it takes some determination to stay in love – but what a wonderful thing to be determined about – and a lot easier with a roof over your head every night, sort of. Our combined retirement incomes are not enough to get a motel room every night. We’re counting on friends to put us up, and camping. The other night we thought we’d found a great place to camp on the beach – the sign said only $8 for the night, and the fee collector said, “It’s true – if you know how to put a tent up.” We drove “Hiawatha” (Bonnie’s Honda CRV) a half mile on the hard sand along the ocean looking for just the right spot, had a heck of a time getting “Big Daddy” (Clyde’s tent) to stay put in gale force winds, and laid our heads down to rest on “Nirvana” (our 3-fold memory foam bed) --- only to find out we’d pitched the tent in the middle of a dune buggy race track with races going most of the night. But we still have our rose-colored glasses on and want to wish all our readers a Very Merry Christmas and a Happy New Year – with a special thanks to all who have put us up. We’re still having fun; still in love; and still (almost - read below) under budget. But our 4-month date is about to end. 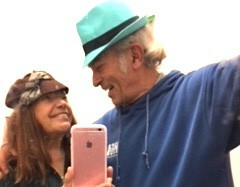 Tomorrow we leave for two weeks at Playa Zipolite (in Mexico) and – after that – Clyde drives back to Minnesota and Bonnie to Santa Fe, with a plan to add Elizabeth the Lion-Hearted to our love life. To those originally skeptical about a four-month third date (after meeting online at Green Singles), we’re now on our 90th day together, with only tiny bumps in the road. And we’re thinking – not that this is ending – but that it’s beginning! We’ve hit upon a plan for the future, which includes both romance and politics – the two things that originally brought us together. - the Green New Deal. Senator Warren has the smarts of the Harvard Law Professor she is; and her life story is 100% working class values. Not only is she friendly and likable, she’s lion-hearted and fierce! – consistently taking on Trump since before day one of his presidency, and being the first to announce she’s running to end his time as POTUS. Yea!!! And best of all – we’re still having fun doing this together! A week ago we were at the launch for a public bank in San Francisco with food, music, an overflow crowd mixed with young, old, and folks of every color. We’ve made so many new friends! Welcome to the Winter of Love! What a great year 2019 is looking like! Each day starting and ending with kisses! What could be better. Tiny bumps? Well, apparently we used up all our amazing luck in 2018 - from finding each other to finding great places to park - the week before Christmas when we almost (but didn’t) run out of gas heading to the Esalen Hot Springs at one a.m. with no gas stations open. Because . . . because on New Year’s Eve day, the last day of 2018, Hiawatha (our car) got towed and it cost $742 !!! to get it out of the S.F. Police Impound Lot . . . and up ‘til then we’d been so careful staying under (our $100 per day) budget. Now, in retrospect, all tiny bumps in 2018 - even the ones thinking about whether our love will last in our peregrinations. P.S. How about a Party (March) on Washington for the Green New Deal? Any techies out there want to help with communications besides Facebooking and emailing? Maybe weekend after Woodstock?